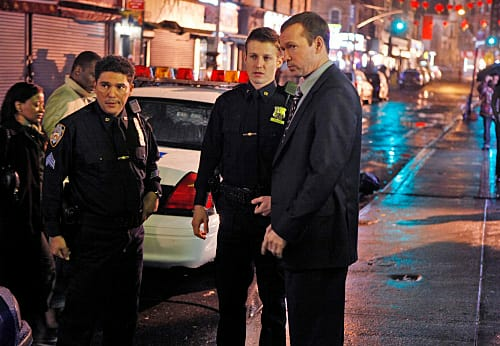 “Chinatown” was a solid, entertaining episode of Blue Bloods, although not a stellar one. The subplot of the Blue Templar still lingers. At least this time it seemed to add a bit of purpose to the story, even if that was only to give Jamie something to hide. I didn’t think Jamie and Sydney would last all season but I didn’t think their breakup would happen this soon. Jamie took her leaving him to go work in London surprisingly well. Maybe that extremely low cut top she wore while telling him was enough of a distraction to ease the pain. I couldn’t see the point in having Frank run into his ex-girlfriend Kelly in the restaurant. Her only purpose seems to be to ask him provoking questions at press conferences and then fade into the background again. I’ve never felt any chemistry between these two. I’m guessing the writers have a longer story arc planned for them but at the moment I just don’t care. I was delighted to see Jackie back as Danny’s partner this week. She has the best lines. Jackie and Danny have great banter, while the dialogue with his other partners just falls flat. As usual the family dinner scene was the highlight of the show. I loved the looks Danny and Grandpa shot one another when Jamie said Sydney wouldn’t be joining them. I’m obviously not the only one who saw the writing on the wall for that relationship. The myriad of reactions to Nicki’s announcement that she wants to be a cop were well played, from Erin’s annoyance to Grandpa’s glee. That scene reminded me why I look forward to family dinner with the Reagans each week. Yeah, I ran it. Where do you think I was, ordering pizza? Permalink: Yeah, I ran it. Where do you think I was, ordering pizza? Hey! That better mean 'try the fried rice' or you're coming too. Permalink: Hey! That better mean 'try the fried rice' or you're coming too.